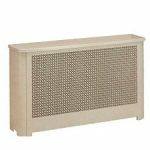 Our Basic Radiator Covers are available in two styles, Montauk which features square corners, and Southampton which features round corners. Both Montauk and Southampton have large front grilles for maximum air circulation into the room. These covers are our most economical. •	Heavy Gauge Furniture Steel. •	Baked Enamel Matte Textured Finish. •	Dust Proof Steel Backs. •	Shoebox Lids are Standard. 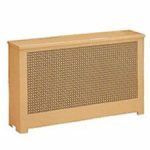 Our most economical radiator cover. It has square edges, non- insulated lid and star pattern full grille. Our do-it-yourself, easy to assemble, radiator cover. The edges are rounded and the grille has a star pattern.